Paul Hardcastle will be in my head all day now. Personally I always liked Bru's efforts on this - that is when he put his finely tuned legal mind to such things. As I was writing an essay for the SH options going into the 6 nations in the international thread it got me thinking about London Irish SQ'd players. I believe J Williams is SQ'd (the IC). He got rave reviews when he started out but has been ignored after his 15 minutes. He may be worth a shout if LI are down. As for Tonks, I hope he can get a contract elsewhere. Edinburgh messed him about once and Glasgow have Jackson and Thompson to back up Hogg (as well as L Jones, Seymour and Mata who can cover 15). Bristol, Sale or Newcastle should be interested even if just to push the present incumbents. Reid would be competing for the 3rd spot with Allan at Glasgow and Edinburgh have Sutherland/Dell/Marfo already. He is another one who could interest the same sort of clubs. J Williams was hot property a few years ago but hasn't really kicked on. Cowan's Scotland days are numbered and I can't see us needing Tonks unless we get a lot of injuries. We've mentioned Steel a few times on here but I don't see him as being better than any of Edinburgh's 9s, and when he's played against us over the last few seasons he hasn't been overly special. Reid on the other hand is someone that stands a chance of going to the next World Cup so probably needs to find himself another club if he can. In other news, Mark Bennett looks set to make his Edinburgh debut against the Kings this weekend and Hardie has returned to training with Edinburgh, albeit his ban runs for another couple of weeks yet. RDW_Scotland wrote: J Williams was hot property a few years ago but hasn't really kicked on. Cowan's Scotland days are numbered and I can't see us needing Tonks unless we get a lot of injuries. We've mentioned Steel a few times on here but I don't see him as being better than any of Edinburgh's 9s, and when he's played against us over the last few seasons he hasn't been overly special. Hard to say how good any of those players are whilst playing in a LI shirt this year. It is very hard to look good in a bad team. Maitland looked rubbish and disinterested when he was there, but a move to Sarries soon had him firing on all cylinders again. Cowan and Tonks international days are behind them now I would say but Williams is still young and looked a very good player a few years ago when he was only 19. Surely he will be worth a chance somewhere else and Edinburgh do seem to need a 12. Might be one to consider if he fancies pursuing his Scottish roots (I believe he is qualified for England, Scotland and Wales). When I have seem them play, I would say that Scott Steele looks like one of their better players as well. He has fought of the challenge from the higher rated imports that have been brought in at SH and still seems to be their first choice. He probably deserves the chance to play in a better team as well. Surely Nel has an impact on the age of 19 claim? tigertattie wrote: Surely Nel has an impact on the age of 19 claim? Not sure the ship has sailed on Tonks. Maitland has been a bit injury prone in recent times and Hogg has had his niggles. Tonks did well against Aus and could tour in the summer (as much as I want to see Kinghorn given a chance). J Williams would fill a need at Edinburgh. Steele should be able to find a contract somewhere (no space for him in the 2 pro sides). Good candidate for Worcester if SRU do buy them. Is this really an ongoing banter thread if topic heading doesn't contain the words "ongoing" or "Banter"
Sorry if I've missed this elsewhere, but any news on the kind of team Glasgow are sending out to Zebre? Is it full strength? Thinking of including the weegies in my accumulator! Thanks in advance! tigertattie wrote: Is this really an ongoing banter thread if topic heading doesn't contain the words "ongoing" or "Banter"
I saw Williams at U20 level (funnily enough vs Scotland). He was/is a very physical presence and was as good as any player on the day. Probably easier to do so at U20 level and tougher when playing with the grown ups. 2 bonus point wins this weekend with no major injuries noted so far. Bennett and Ashe both got back into things as well which is a good sign for Scotland. Hopefully Leinster and Connacht prevail to bolster Edinburgh and Glasgow's respectively. Edinburgh are unlucky to be in the wrong group. We could use the Westies fronting up a bit here. So it has been a good weekend of results for Edinburgh, with us now only 3 points behind Ulster and automatic qualification for the Champions Cup. Edinburgh certainly have a tricky run in to the season but looking at Ulster's theirs has its challenges as well. We play them away from home during the 6N, but I suspect their reserve squad is better than ours. We're probably likely to finish 4th leaving us in a playoff, likely against the Blues or Connacht. If we manage to get a home fixture I fancy our chances, but away from home we won't be favourites. Plenty to play for in the run in! Edinburgh have loads to play for in the run in, they really are in with a shout of qualifying and should be setting that as their goal. Ulster have been woefully inconsistent and clearly have deeply ingrained problems of their own. Edinburgh despite their improvements are still not going to lose to many players to Scotland and should still get a decent side out. 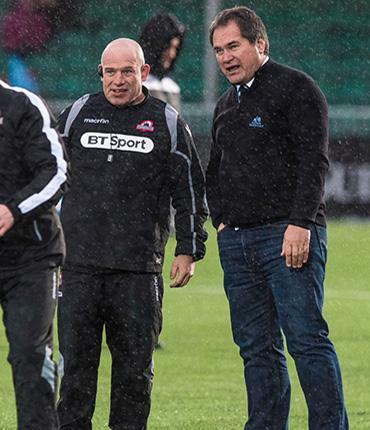 The group may well come down to the home and away fixtures against Ulster. Friend of mine met him last week and sadly he is loving the city of Edinburgh, Welly. We've already gained more league wins (2 more in fact) than last season! Well, you've got to be proud of something, I guess. 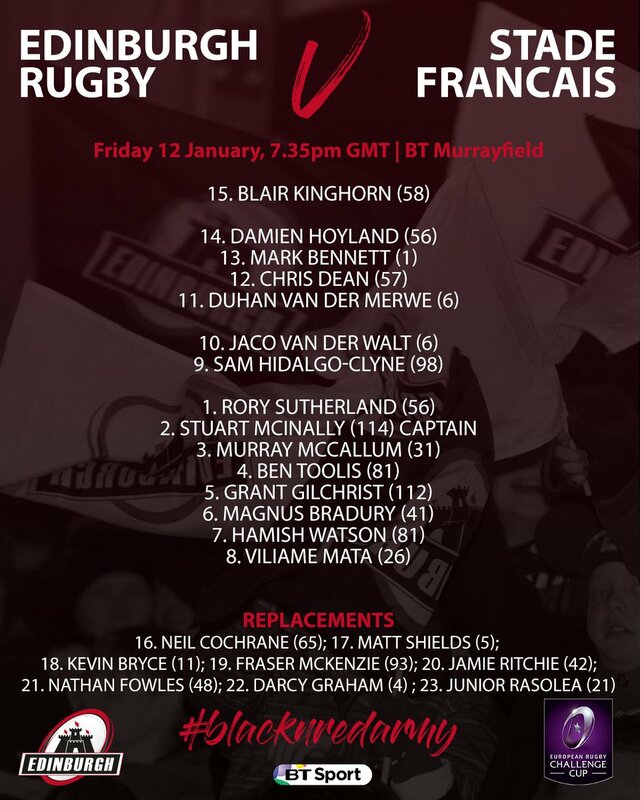 Edinburgh game is switch to Murrayfield again for the SF game this Friday. The pitch at Myreside was starting to cut up really badly last week and clearly has not recovered. If Edinburgh are going to stay playing there, then surely a 4G pitch is going to be the answer for them as well. That's certainly no surprise - the pitch was in a right state and the weather this week would leave little chance to improve. It is a shame as to build momentum and try to turn fans around to the idea of playing there they really needed a good run of games at Myreside. Unfortunately there's only 4 games left this season, and the next game is at home to Leinster on 8th Feb (ages away) so can't imagine there will be many travelling supporters to boost the crowd. Don't we need to play our Euro games at Murrayfield anyway due to min seating requirements or is that for the big cup only? Edinburgh going for it against Stade. Kevin Bryce makes a return! BT don't seem to be showing the game. Any idea if its on the telly box at all? Hardly any Challenge Cup games are on TV, and if Sky or BT aren't showing it no other broadcaster is allowed to. Edinburgh can't even do Facebook live or equivalent to live stream the game! I think it is long overdue that we find out if he has what it takes at tighthead or not! He's hardly played there since moving 2 seasons ago. The odd game he has played hasn't been overly inspiring. Bradbury to start and Ritchie on the bench, what does that say about what Cockers thinks about CDP? Does Toonie share those thoughts? I am assuming he is fit of course, always smoke and mirrors from Edinburgh on that department these days. Good to see Chris Dean get a run out at 12 as well. If he is to nail down a starting position in this Edinburgh team going forward it is likely to have to be at 12 and not 13. CDP has played in the last 4 games, so is likely being rested as per the SRU player management stuff, which I think restricts it to 5 games in a row, ensuring he can play next week in France. Can't say I'm glad to see K.Bryce on the bench, nothing against him, he's just not made the move to TH particularly well (not his fault), we will be significantly weaker in the scrum if he comes on. I think the Cheetahs game showed exactly what he's capable of. Namely, giving away 2 penalties on the trot and being subbed off for the person he was brought on for. I didn't even know you were allowed to do that, unless there was an injury. He's a complete waste of space and I wonder if there's some sort of HR requirement which needs to be fulfilled due to him being asked to change position. EWT Spoons wrote: CDP has played in the last 4 games, so is likely being rested as per the SRU player management stuff, which I think restricts it to 5 games in a row, ensuring he can play next week in France. I would have thought he would have picked his strongest available team for this game, if they win, then they can afford to rest a few next weekend, when the result will be academic and SF won't give a cr*p anyway. He does not seem to have applied the same logic to Toolis and GG who seem to start every game now. I think there is a bit of flexibility with the Scotland resting players protocol in any case. It would be madness to compromise their chances of qualification because of it! Gilco has played in 3 of the last 5 so still has a couple of games left. This would be Toolis’ 5th game in a row, so I guess he could be likely to miss next week, which is possibly another reason why CDP was rested this game, so he’s back next week when Toolis is out. You might be right with regards to the flexibility, but I assume there has to be a very good reason to go against the 5 game rule, as it’s not like coaches are not aware of the fixture list early doors, and should (aside from massive injuries) be able to plan their squad rotation throughout the season. This is all speculation, but given CDP has started most weeks throughout the season (when available) I don’t think Cockers has any issue with him, or anything can really be written into him missing this game. Fingers crossed CDP has been dropped, would much prefer to see Mata, Bradbury, Ritchie & Crosbie at 6/8. Relief to see Sutherland back, could he start against Wales? Excited to see this back-line in action, really like the Dean/Bennett combo. I tend to agree with reallybored about CDP. He has been better this year but he is just not the same player since his injury, he just does not have the same explosiveness about his carrying and is nothing like as mobile. That is a shame because from his early performances in an Edinburgh shirt, he looked as if he could have been a standout international. He is still a decent player, but has a lot to prove at international level and in a more free flowing Edinburgh team these days. Not reading anything into CDP being dropped. He has played a fair few games this season and may be needed by Scotland next month. Last break before then. It may balance the back row better. Mata was originally at 6 last season when he played with Bradbury I thought? Be interesting to see how they mesh. When Ritchie comes on, the back row will look more traditional. Kinghorn is covering 10 by the looks of it and Dean gets a chance to put down a marker for the 12 jersey. Pretty happy to see that. Surprised that McCallum already has so many games under his belt. Thought he had maybe 15-20 not 30+. Sutherland and McCallum have these 2 games to get their spots in the Scotland 23. What is happening with Carmichael? He played well last year and went off to Super Rugby. Does Cockers not like him as a 2nd row or is it purely down to good form of the guys in front? Carmichael is still a bit of a beanpole and in the odd game he's played lately he's come into the back row. Cockers knows his starting combo and has generally gone for McKenzie on the bench - perhaps as he's club captain. With at least one of the starting locks involved with Scotland in sure he'll get his chance over the next few months - he's a great athlete. We've hardly seen anything of CHH this season so would be nice to see him get a run out too. If both toolis and Gilchrist are rested for Scotland both of them should be in the squad for Edinburgh during the 6N. What is very pleasing about that Edinburgh backline is the oldest player is SHC at 24! In fact that forwards aren't exactly seasoned warriors either.